We must all know, browsing the websites of our popular network providers have not been a fun time. They’ve generally been pretty cumbersome to navigate – simple things that needed to have been brought to the front weren’t there; plans & phones seemed to be in some sort of confusing mess; and the usual account information and offerings seemed too hard to browse and find – not to mention that it was even harder to find help for your devices when you needed it. Well, it seems at least, one telco is going out of their way to change that: Globe Telecom. In a recent upgrade to their online portal, the company have radically improved the way you navigate the system – with a lot of sought-after features front-and-center; sections divided into dropdown menus (plus Support features); and even implementing new ways for consumers to “Self Serve” by having access to account features, bill payments, subscriptions, billing information, and other services without needing to communicate with a Customer Service Representative. With this new change, Globe is hoping that more consumers are now able to take full advantage of their multi-tiered services. Access is now given to your account via Facebook, Google and/or Yahoo, and you can get updated information about your postpaid bill, prepaid credits, and/or enroll to new services like promos, call/text buckets, and internet services – all without the need to go to a Globe Center or contact the Customer Service hotlines / ticket systems. 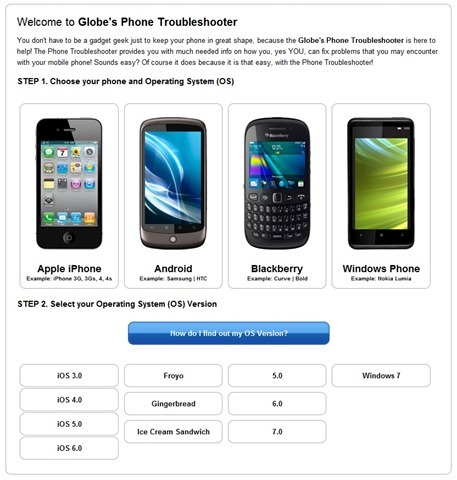 What’s more, there’s a new step-by-step tutorial system that can walk you through some of the most frequent setup and troubleshooting questions on popular Smartphone platforms. Of course, that includes Apple’s iPhone, Google’s Android phones, RiM’s BlackBerry devices, and Microsoft’s Windows Phones. The tutorials are complemented with screenshots of the phone’s current screen UI, giving you a visual representation of what you should be doing – a feature that’s sure to be a big boon for technophobes and/or new smartphone users. For Globe postpaid and prepaid subscribers, this signals another new turn for the telecommunications company. By providing more features to be easily accessible via simpler self-serve systems, (eg. Globe’s *143# hotline and an easier-to-use website) they’re hoping that more users are able to put their plans and credits to better use. Additionally, we were promised that even more features will be available as they improve the site more – some of which we can’t talk about here, but we look forward to tell you when they do arrive. 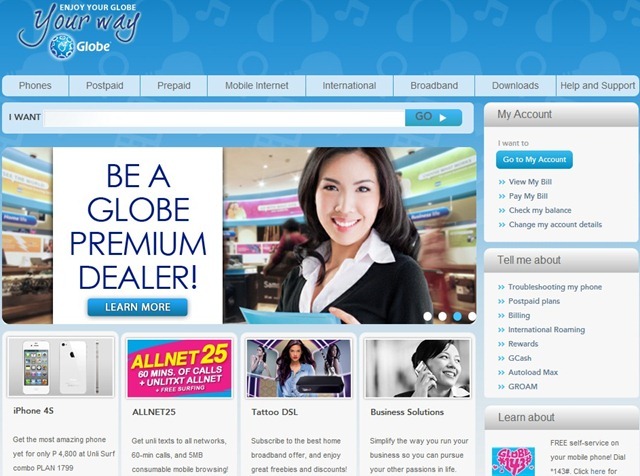 To check out more of what you can do with Globe’s new portal, check out their website here. Or if you want to learn more about what the #BigTimeShow crew thinks of the upgrades, check out our BTS video clip below!